Group of friends sitting in multiplex movie theater. 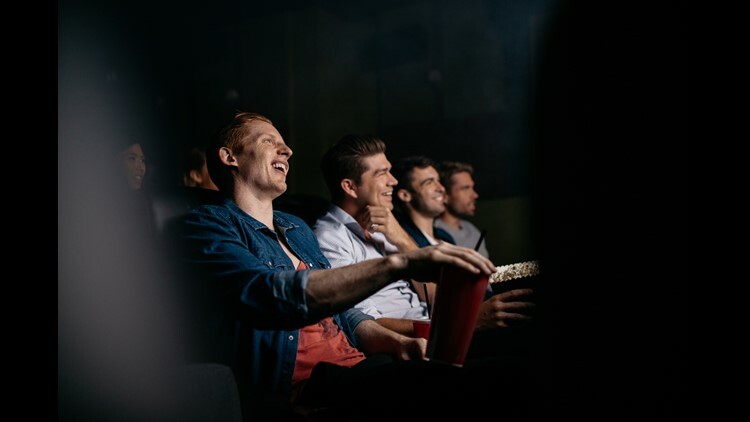 Young people watching movie in cinema hall and smiling. Taking a trip to the movie theater has always been an exciting experience. It's not just about being able to catch the latest film, it's about the people you're with, the buttery popcorn you get to eat, and seeing the film up on the big screen. The only downside to this nostalgic experience everyone loves is the exponentially rising price. The price of a movie ticket has only been increasing since the start of movie theaters. According to a recent survey, the annual average price of a ticket has gone up $3.26 since 2000, now sitting at $8.65. If you live in any major city, you know this isn't always the case. In DC, people are used to paying $15 for a ticket, almost double the national average! Finally, a solution to our woes has arisen. An app called MoviePass is offering their services, which is to be able to see one movie per day, for only $9.95 per month. This means that you would only have to go to the movies TWICE a month for this to pay off, if you're going by the $8.86 annual average. MoviePass originally offered their services for a steep price of $35, which meant you had to go four times a month for it to pay off. This didn't attract too many people, so with a new CEO (and Netflix co-founder) Mitch Lowe and a total reworking of the company, they drastically decreased their prices. MoviePass completes their one ticket per day services through the use of a credit card they send you. You pay the $10 a month through their app, then you select the exact movie you're going to see, and the company adds that ticket amount onto the credit card for you to use. You use this credit card at the theater to pay for your ticket. There's no gimmicks or fancy scanning you have to do, just using the credit card they send you! If you're interested in MoviePass, check out our top picks for movies for the month of August and get going! Want more articles like this? Watch Great Day Washington every morning at 9am on WUSA9 & follow us on Facebook, Twitter and Instagram!